In the summer of 2010, SCCF joined forces with Captiva Cruises to offer children an opportunity to leave the busy world of the shore behind, explore the waters of Lee County and tickle their toes in the surf of a distant island. The No Child Left on Shore initiative is intended to give children who might not otherwise experience being out on a boat a chance to learn about the bay and gulf. SCCF raises funds from donors who share in the belief that first hand, unforgettable experiences enriches children's lives. Captiva Cruises reduces the rates of their charter boat excursions, invited youth groups usually arrange transportation and chaperones. Kids participating in programs of the Immokalee Foundation may be selected on merits such as most volunteer hours served or most academic improvement over the past year. A school group from Lee County Schools may be on board thanks to a highly motivated educator who knows the outdoors is a great teacher and the experience can be built on in the classroom. Kids from LaBelle are members of the 4-H marine science program there. SCCF’s environmental educators reach thousands of residents and visitors every year with programs that encourage the conservation of coastal habitats and aquatic resources on Sanibel and Captiva and in the surrounding watershed. Designed by SCCF educators Kristie Anders and Captiva Cruises’ Richard Finkel and Paul McCarthy, NCLOS is a collaborative outreach project between SCCF and Captiva Cruises, the anonymous “Boat Lady,” the Schlossman Family, and many other supporters of SCCF’s annual operations. This program addresses the real need to provide the children of Southwest Florida experiential knowledge of the Caloosahatchee watershed and estuarine environment. Shrinking school budgets have drastically reduced the number of educational field trips previously funded. Many Southwest Florida families, especially those with language, cultural, physical and economic barriers, do not have opportunities to get out on the water. Their children have never held a live sea star, shrimp or snail. They have never waded in shallow sea grass beds and observed a horseshoe or spider crab. 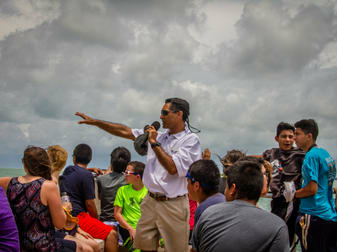 Thanks to No Child Left On Shore’s on-water educational field trips, that is beginning to change.